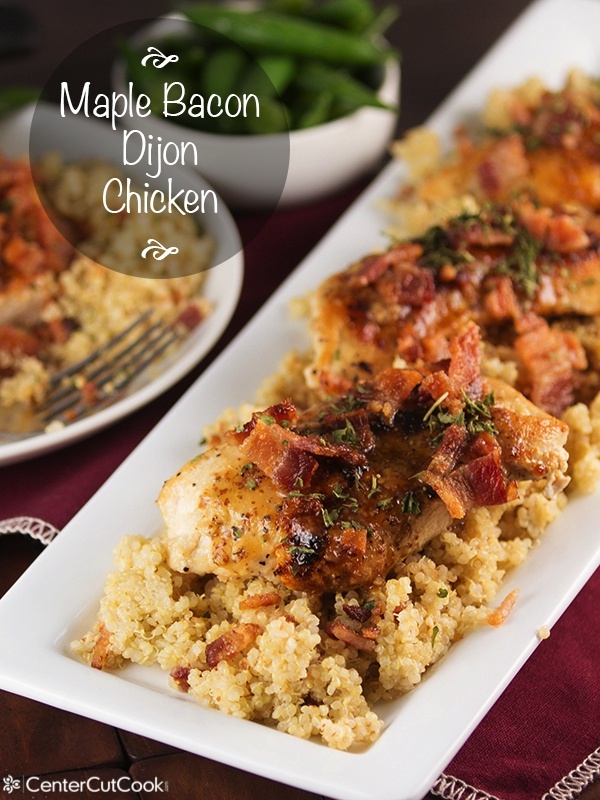 Maple Bacon Dijon Chicken: a simple chicken and bacon skillet recipe that incorporates the flavors of maple and dijon. Served over quinoa, this is a 30 minute dinner your family will love! I’m always looking for simple chicken recipes that are easy, healthy, and can be made for dinner on busy weeknights. Bonus points if they are kid friendly! Because chicken and bacon are two of my faves, I decided I wanted to come up with a great recipe that incorporated the two, but was also pretty quick to make. During the week I don’t like to spend more than 30 or 40 minutes making dinner. 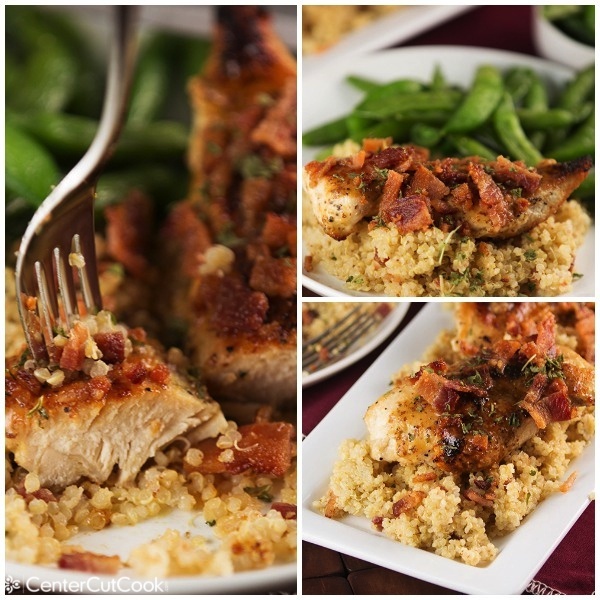 Not only is this recipe made in 30 minutes, it’s packed full of flavor thanks to the winning combination of real maple syrup and dijon mustard that lightly coats the chicken, and is also used to flavor the quinoa served on the side. At first, dijon mustard combined with maple syrup might sound like an odd combination. Let me assure you that they go together perfectly! The sweet maple syrup balances out the strong, bold flavors from the dijon mustard and you’re left with a slightly sweet sauce that’s perfect! Oh, and can we talk about the bacon? I cooked up 6 slices of bacon (in the oven, of course! Here’s my guide on How to Bake Bacon), then chopped the bacon up into little pieces. You will stir half the bacon into the quinoa, and the rest you’ll sprinkle on top of the chicken right before serving. Yum! If you don’t have quinoa on hand, or you don’t like it, you can always use rice instead. I love quinoa because it’s a “super grain” – rich in protein and all kinds of good things for you! From start to finish, this recipe will only take you 30 minutes which is just perfect for those hectic weeknights. Enjoy! As the quinoa is cooking, prepare the chicken by seasoning it liberally with salt, black pepper and garlic powder. Heat 2 tablespoons extra virgin olive oil in a large non-stick skillet over medium-high heat. When the oil is hot, add the seasoned chicken and cook for about 6 minutes, then flip the chicken and cook for another 4-6 minutes, or until the chicken reaches a temperature of 165 degrees. I like to use an instant read thermometer to prevent over or under cooking the chicken. To make the sauce: combine 1/4 cup dijon mustard with 1/4 cup real maple syrup, 1/2 teaspoon salt and 1/4 teaspoon black pepper. When the quinoa is done cooking, stir in half of the cooked bacon, and half of the sauce. When the chicken is done cooking, transfer it to a plate and spoon the remaining sauce over the chicken. Cover with a foil tent and allow to rest for a few minutes. To serve, place a heaping spoonful of the quinoa on a plate. Top with a piece of chicken, then sprinkle bacon on top. 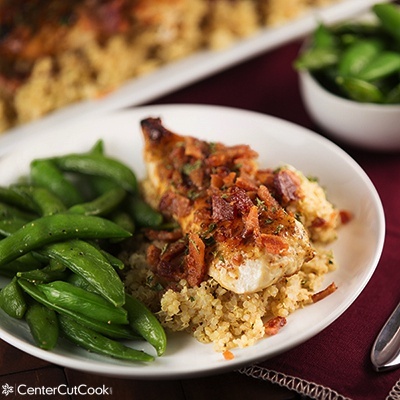 I like to serve this Maple Bacon Dijon Chicken with sugar snap peas seasoned with olive oil, salt, and black pepper.